Covertex Crank Up Channel Blinds are a great solution to transform your outdoor patio area into an enclosed sun room living environment. 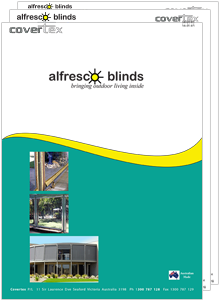 Alfresco Channel Outdoor Cafe Blinds can generally be retrofitted to most pergolas without the requirement to modify the existing timber / steel structure. Blinds can be quickly extended or retracted in a matter of seconds allowing the instant transformation of the living environment. With the ease of bottom side restraining latches securing or releasing blinds is simply a breeze. Blinds are also able to be locked in at variable height locations. Blinds are manufactured from either 1mm PVC or high tenacity PVC coated polyester mesh to satisfy the most demanding of exposed sites. Spindle hardware is zinc plated and side & bottom rails are manufactured from extruded aluminium that can be supplied in a natural or powdercoat finish.